Innisfree Jeju Volcanic Pore Clay Mask. 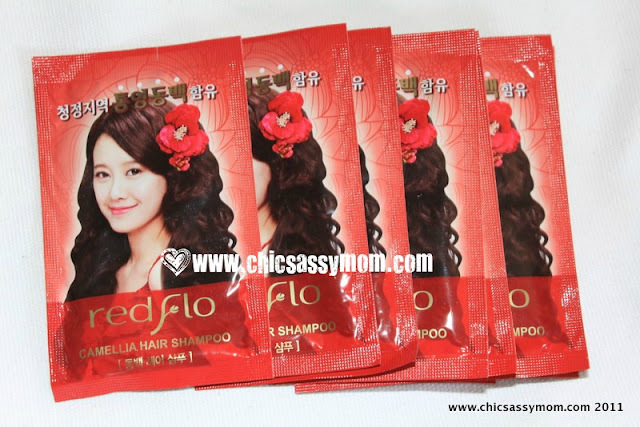 Somang RedFlo Red Camelli Shampoo, SkinFood Rice Masak Wash off and freebies. I needed to get a couple of SkinFood Rose Essence Tinted Lip Balm Mini's for the giveaway prizes and gifts. Among with two auction wins, and Buy-it-now's, I ended up stashing more Korean Cosmetics lovelies. I also received several queries on how I do e-Bay. I'll do a brief run through below. Before mask sheets, the SkinFood Rice Mask is my mainstay supplementary skincare item. I did a post of it here. I've since run out of it, so a refill was in order. I tried few packs of it as freebies, and so far, it seems they'll do just fine. Anyhow, a pack is way cheaper than the SkinFood Pomegranate Shampoo's trial pack. So I'm pairing it instead with the SkinFood Pomegrenate Hair Pack. I'll be back to do a more detailed review for these new haircare items. I might also get the matching conditioner, which comes in 750ml bottle, definitely more affordable than SkinFood's. While we're at eBay, I actually received several inquiries on How to buy, pay, etc. I'll do a run through of eBay/Online shopping basics. 1. Visit eBay Philippines at http://www.ebay.ph/. Register or Sign in. 2. Then just type the item that you would like to buy in the search box, much like googling it. Either that, or just go to the specific store or seller, if you know it. 3. Feedback scores mean a lot. It's the number after the eBay ID, and have a color-coded star besides it. For the protection of both seller and buyer, you can read through the feedbacks available. 5. If you're not sure about the descriptions of the items, ask away. Don't click 'Bid' or 'Buy it now' just yet. 6. Some sellers list their mobile numbers, others won't. So just take time to ask for clarifications if needed either by texting or in the 'Ask Seller' option.If you have questions on just about anything (shipping, meet-ups, pick up etc. ), please ask away. 7. Some sellers would also require a buyer for more details (contact numbers etc. ), if you're relatively new or have lower feedback scores. It takes time to build on your feedback scores. So avoid going into disputes, so as not to avoid negative feedback. 8. In my experience, so far most eBay sellers are friendly and competent. Communication plays a vital part. The sellers do list their items in the most detailed way possible, they also set their conditions or selling terms, if you don't agree on some items, negotiate, or walk away. 9. For payment, I usually go for sellers that accepts PayPal payments. But before buying or bidding, please ask beforehand their accepted mode of payments (bank deposit, GCash, PayPal, etc. ), if it's not mentioned in the product listing just to avoid any unnecessary disputes in the future. Is your favorite ebay seller from Angeles too? I'm at ebay.ph too. But I sell books. Hehehe! @ChinaDoll: Yay! She's from AC. :) BHappywithMe is it. @Ressa: Check out KPOP Collections Cosmetics, Accessories & Apparel on FB (my friend's ;-D) or BHappywithMe on EBay. ;-D I go for pick up with BHappywithMe, lucky me ;-D, but my online shopping usually takes about 2-3 days at most. Ate, kakatuwa naman. Bilis mo magreply! Ka-kaaddict pala magshop sa ebay through BHappywithMe. HAHAHA! Dami ko gusto itry na Innisfree stuff dahil nababanggit ng Korean students ko :) Sige try ko yung sa friend mo. Thanks again!